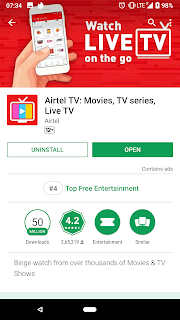 Chandigarh 07th June:- Airtel TV, the popular video streaming and LIVE TV app from Bharti Airtel (“Airtel”), has crossed the 50 million users mark on Android platform, underlining its growing popularity amongst smartphone users as the go to destination for digital content. Airtel TV app has scaled up its user base on the back of one the widest content catalogues and great user experience driven by an intuitive UI and other innovative features. The app currently offers over 375+ LIVE TV channels to go with 10,000 + movies and popular shows. Airtel TV has forged content partnerships with the likes of Eros Now, SonyLIV, HOOQ, Hotstar, Amazon, AltBalaji with several more on the anvil. Sameer Batra, CEO - Content and Apps, Bharti Airtel said that we are thrilled at achieving this milestone and being able to scale up the app so rapidly. This is a strong endorsement from our users and a result of our unrelenting focus on delivering a world-class in-app experience. We will continue to expand our content partnerships and bring more exciting innovations to our users. Airtel TV app was the amongst the most downloaded* video OTT apps in India between Jan and May 2018.